is you like to perform and I'll work with that. Sorry, but I have to cancel my performance for personal reasons at the advice of my advocate. Screeeeech! Rewind erase erase erase! 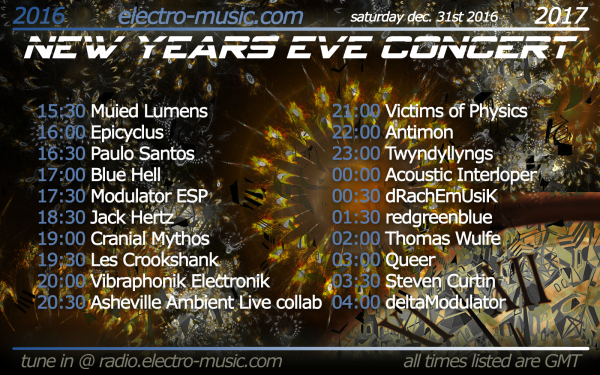 After resolving the issue that spooked me, I am happy to report that I will in fact be able to perform on NYE. Same time, same place, same me. 8. This will be a preview of the new album I'm working on, 'RESISTOR'. Well I've been to one world fair a picnic and a rodeo and that's the stupidest thing I ever heard come over a set of earphones. I can't commit to anything but I'll be there if I'm not elsewhere, ie working. Thanks for the port check, Robsol & Blue Hell. AI @ 8088 is set to fly. small changes so please check to see if your assigned time slots are still ok.
LOVELY! Will start sharing around. I would like to sign up for a two hour block if that's possible. This is a great way to do it. Splendid. p.s. I decided to do a nostalgic review of my participation in em for the show. Sort of a "best of Les" show if you'll allow the self promotion of it. I have four or five days to prepare for it, and I've got 20 minutes or so already, so we shall see! 6. Description (Style/Genre/Equipment, etc. - Optional): Experimental Ethno-Ambient with handmade/modified electronic and string instruments. I've been doing the monthly streaming shows, so I don't think I need to test my port, but if there is something I need to do please let me know! So indeed there would be no need for additional tests. I've put *'s on you. is skipping (probably a result of the drops). I am used to it and it is not too bad but I am wondering what might be causing it. Yes I'm using wifi. The studio is in the basement and the router is upstairs. Sorry about the dropouts - I'm not sure there's anything I can do. I've posted recordings of all the shows. and I've listened to them multiple times. Looking forward to NYE! Steven Curtin has been added to the schedule and the poster has been updated. Connected and ran a broadcast test on port 9878. Seemed to work just fine. The musical world I inhabit. Ok, Charles, thanks for testing, I'll add a * on you. Looks like an awesome event!